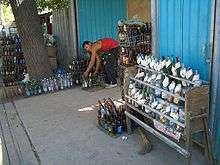 Refillable glass bottles collected, and deposits refunded, at a collection point in Bishkek, Kyrgyzstan. Deposit values (from 50 tyiyn to 2 Kyrgyz som, i.e. 2–5 U.S. cents) for various bottle types are posted next to the sample bottles on a rack. Container-deposit legislation is any law that requires collection of a monetary deposit on soft-drink, juice, milk, water, alcoholic-beverage, and/or other reusable packaging at the point of sale. When the container is returned to an authorized redemption center, or to the original seller in some jurisdictions, the deposit is partly or fully refunded to the redeemer (presumed to be the original purchaser). It is a deposit-refund system. A & R Thwaites & Co in Dublin, Ireland, announced in 1799 the provision of artificial "soda water" and that they paid 2 shillings a dozen for returned bottles. Schweppes that also was in the business of artificially made mineral waters, had a similar recycling policy about 1800, without any legislation. Scottish bottled beverage companies also voluntarily introduced such a scheme to encourage the return of their bottles for reuse. In Sweden a standard system for deposits on bottles and recycling was established in 1884, eventually by law. The popular demand for a deposit on aluminium cans to reduce littering led to legislation in 1984. In the days when bottles were washed and re-used, drinks manufacturers paid for the return of their (proprietary) containers, but with the advent of single-use containers great savings were possible, leaving their disposal as the consumer's responsibility. While a national scheme has been repeatedly delayed largely due to unveiled threats from the beverage industry of multimillion-dollar ad campaigns against politicians who support it and disagreements between the states, there has been a growing momentum of state-based operated container deposit schemes (CDS). Currently all states except Victoria and Tasmania look to have some sort of state-based container deposit scheme operating within the next 2 years. With 8 billion beverage containers landfilled or littered every year in Australia, proponents argue that it is the most effective method to reduce such litter; and improve recycling above that achieved by kerbside. It also has many co-benefits such as funds for charities and several thousand new jobs, that cannot be achieved by other approaches. The state of South Australia has a refund of 10 cents per drinks carton, can or bottle (only containers marked as eligible for refund; does not include wine & spirits bottles, milk cartons). This has been in place since the 1970s. Northern Territory introduced one in 2012, however after a challenge by Coca-Cola Amatil in the Federal Court of Australia, on March 4, 2013, this ended temporarily until the Northern Territory government stepped in to keep the scheme going until such time as an exemption to the Mutual Recognition Act (the basis of Coca-Cola Amatil's court challenge) could be secured. This exemption was secured on August 7, 2013, making the container deposit legislation effective once again and this time permanent. The state of New South Wales has announced the start date of a state based scheme commencing in July 2017. The Queensland government in February 2015 indicated its strong support for a scheme in Queensland potentially in partnership with New South Wales for implementation in 2017-2018. Container deposit legislation is supported by 85% of Australians. Eventually the The Queensland government on July 22, 2016 announced that that state will have a container deposit scheme purportedly to get drink cans and bottles off beaches and out of parks and public areas. The government confirmed that the initiative will start in 2018. The state of Western Australia has announced the start date of a state-based scheme commencing in 2018. Smaller beer bottles (25 or 33 ml) carry a €0.10 deposit, and larger ones (75 ml or 1 l) a €0.20 one. Some fruit-juice bottles, such as those sold by Oxfam Wereldwinkels/Magasins du Monde], carry a €0.30 deposit. Some hard plastic milk bottles such as those sold by Delhaize carry a €0.20 deposit. The Canadian provinces and two of the territories have their own deposit refund systems (the territory of Nunavut is the only jurisdiction in Canada with no deposit refund system in place). Deposits range from 5 cents (¢) to 40¢ per unit depending on the material and size of the container and whether the beverage originally contained within is alcoholic or non-alcoholic. In Croatia a deposit of 50 lipa was placed in 2006 on non-reusable containers with minimum volume of 200 mL. Plastic or metal containers with a sign are taken back in supermarkets and shops either by human staff or by reverse vending machinery. In the Czech Republic most beer is sold in returnable glass bottles that carry a CZK 3 deposit. These bottles are collected by shops and supermarkets. Reverse vending machines have mostly replaced human staff. There is also a CZK 100 deposit on plastic beer crates with a 20 bottle capacity. Most reverse vending machines accept an entire crate full of empty bottles, returning CZK 160. There is no deposit on other containers. Refillable glass bottles over 0.5 L: 3 kr. Cans and glass bottles under 1 L: 1 kr. Plastic bottles under 1 L: 1.50 kr. Cans, glass and plastic bottles of 1 L and over: 3 kr. In Estonia there is a universal deposit and recycling system since 2005 for one-time and refillable containers. In 2012, 90% of all PET bottles, 63% of all aluminium cans and 86% of all glass bottles sold in Estonia were returned into the deposit and recycling system. About the somewhat lower can and glass bottle return rates it must be noted that due to so-called "alcohol tourism" a remarkable number of beer cans and bottles are taken to neighbouring Finland and are not returned to Estonia. The donation buttons on vending machines which give your deposit amount to the charity organization were introduced in 2011. By the end of 2012, 49% of all vending machines had donation buttons. All of the deposits are €0.10 per bottle/can. Recycling first started in 1952 with the Coca-Cola bottles and refillable plastic bottles became recyclable in the 1980s. Deposits on aluminum cans were introduced in 1996 and on PET bottles in 2008. The recycling is administered by Suomen palautuspakkaus Oy (abbr. Palpa), which is a private consortium of beverage importers and fabricators. Glass bottles have almost 100% recycling and are refilled 33 times on average. Aluminium cans have a recycling rate of about 94% and PET bottles 92% (2010), deemed to be top statistics internationally. The scheme is, in technical sense, voluntary and Palpa does not hold a legal monopoly for container deposits systems. However, it is the only such system in operation. Those beverage containers that do not belong to a container deposit system are levied an excise tax of €0.51/L, regardless of the container size. The tax is so high that essentially all beverage manufacturers and importers opt to join the Palpa system instead of paying the excise tax. In Germany container deposit legislation, known as Einwegpfand (single-use deposit), was passed in 2002, and was implemented on 1 January 2003. However, its implementation was fought by lobby groups of German bottling industry and retailers. This fight also included trials at the Federal Administrative Court of Germany and the Federal Constitutional Court of Germany, but all trials were won by the German federal government. The deposit legislation does not cover containers for fruit juice, milk-products, wine, spirits, liquors, and certain dietary drinks. As of 2010, the standard deposit for all single-use containers (cans, single-use glass and plastic bottles) is €0.25. Shops accept return only of single-use containers which have the same material as sold. The deposit for refillable bottles is not defined by law. The usual rates are locally €0.02 for some wine bottles, €0.08 for beer bottles up to 0.5 L, and €0.15 for beer bottles with flip-top closures, beer bottles over 0.5 L and other bottles (mostly water and soft-drinks, lesser fruit drinks, milk, cream, yoghurt). Some bottles have an even higher deposit. Bottle crates have a deposit of €1.50. Shops only accept bottles of sold vendors and sizes. Most supermarkets in Germany have a reverse vending machine designed to be used by customers which scans "Pfand" returns and prints a receipt to the total value of the items given which can in turn be exchanged for cash or used against the value of ones next purchases. In Hungary, beer, wine and standardized liquor bottles carry a deposit on them, which was liberalized in the recent past. Beer bottles have 25 forints on them, but for wine glasses and for liquor bottles, the sum is decided by the trader, which people can exploit by buying a drink in a certain retailer and bringing the bottle back to its rival who have a bigger deposit on it. PET bottles and metal beverage containers are taken back only by some super- and hypermarkets, such as Lidl, Auchan, Tesco, Interspar. They all use reverse vending machines to collect them: for bottles and in most places for the PET bottles they use a Wincor-Nixdorf or a Tomra machine, while ALU cans are collected by the Hungarian ALU-press machine. Its advantage is that it accepts flattened or pressed cans as well, and it crushes them with a pressing machine, thus improving the storage capacity of the machine. The containers' prices - 2 forints/ALU can and 1 forint/PET bottle - do not widely motivate people to revend these containers. Iceland has had deposit system on a national scale for a wide range of containers since 1989. The deposit is same for all bottles and cans: 15.00 króna. The historical recycling rate per product is approximately 90% aluminum, 87% PET and 82% glass. In Israel, there is a 0.30-shekel (₪) deposit on beverage containers from 101 to 1499 mL, except for dairy products. Businesses are required to accept bottles if they sold them, or if they are larger than a certain size (28 square meters at least) and sell beverages from the same manufacturer or importer. Businesses are not required to accept more than 50 bottles per customer. The deposit was ₪0.25, but was raised shortly after the ₪0.05 coin was discontinued. Most 500 mL beer bottles (local brands such as Goldstar and Maccabee plus certain imported ones like Carlsberg and Tuborg) have a deposit of ₪1.20, and are willingly accepted even by smaller businesses (plastic water bottles, glass wine bottles and soda cans are mostly accepted by larger supermarket chains, some of which possess reverse vending machines). In Lithuania, there are deposits on nearly all containers for consumption-ready beverages. All of the deposits are €0.10 per bottle/can and most of return is done using reverse vending machines. (D) Glass bottle (all sizes): €0.10. Large polyethylene terephthalate (PET) soda bottles carry a €0.25 deposit. Discussions about this deposit are ongoing in Dutch politics. The deposit might be lifted in 2015 but some political parties on the other hand want to extend the system. Beer bottles carry a €0.10 deposit, and beer crates €1.50. New Zealand had no container-deposit legislation until 2008 when the Waste Minimisation Act 2008 passed into law. The Act has provision for product stewardship of which container-deposit legislation is the most familiar type. As of 2010 there is no widespread deposits available on containers with some beer bottles being a notable exception. In 2005, 93% of all recyclable bottles and 80% of all drink cans in Norway returned into the deposit and recycling system. That year also saw 280 million krone in deposits being paid for the return of 194 million cans and 49 million bottles. Deposits on drink containers have a long history in Norway, starting with deposits on beer bottles in 1902. The deposit back then was 0.06 kr (3.30 kr in 2006 currency value). This deposit arrangement was later expanded to include soft drink bottles. Up until 1 January 2001, the Vinmonopolet government wine and spirits monopoly chain had deposits on products made by the company itself, this did not include imported products. The legislation regarding container deposit systems was updated so that from January 1, 2006, containers from other plastics and metals, e.g., steel cans, can be included in the deposit systems. The law also makes it illegal in Sweden to sell consumption-ready beverages in containers that are not part of an authorized Swedish container deposit system, with the exception of beverages that mainly consist of dairy products or vegetable, fruit, or berry juice. However, private importation from (mainly Eastern European) countries without deposit occurs by vendors that thus compete with a somewhat lower customer price. 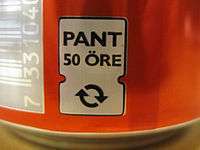 The recycling of these contraband cans has been low as seen as a problem, but Returpack made a campaign in 2010 offering 0.10 krona for each imported can (without deposit) to the benefit of WWF, retrieving 17 million cans. In 2011, a similar campaign was repeated, retrieving almost 18 million cans. Non-deposit glass containers are collected in large glass garbage bins, for clear or coloured glass, placed centrally in most urban areas. The 1.5 L refillable PET bottle with a deposit of 4.00 kr has been discontinued, and has been replaced by the 1.5 L non-refillable PET bottle. The last day for returning bottles made by Spendrups for deposit was 30 June 2007, and the last day for bottles made by Coca-Cola Sweden was 30 June 2008. In Switzerland, there is a government ruling that 75% of containers must be returned, otherwise a deposit system may be introduced. Until the turn of the 21st century, most British bottled beer was sold (whether in off-licences or pubs) in standard quart, pint, half-pint or third-pint (nip) bottles, although some brewers preferred their own distinctive designs. The standard deposit was 7pence (p) for a pint bottle and 5p for a half-pint. However, in the absence of legislation, and given the switch from pub to supermarket sales, and from Imperial to metric measures, the industry has now entirely abandoned refillable bottles. Beer casks sold for the home or party consumption of draught beer are usually also loaned out against a deposit which may run to several tens of pounds. In the days of refillable milk bottles, such bottles were deposit-free. The United States container-deposit laws are popularly called "bottle bills" after the Oregon Bottle Bill, the first container deposit legislation passed in the U.S.
Delaware (5¢), introduced 1982, abolished 2009, replaced by Universal Recycling law. ↑ "Archived copy" (PDF). Archived from the original (PDF) on October 14, 2012. Retrieved October 27, 2012. ↑ "BottleBill.org - The British Columbia Deposit Law". ↑ "Millions of dollars in attack ads coming in March". The Sydney Morning Herald. ↑ "Boomerang Alliance". Boomerang Alliance. ↑ "BottleBill.org - Beverage Container Legislation in Australia". ↑ "Coca-Cola wins Federal Court case, cash for containers recycling found illegal". NewsComAu. ↑ "NSW Premier Mike Baird announces 2017 start date for cash for cans". The Sydney Morning Herald. ↑ "Australia moving closer to nationwide container deposit law". Plastics News. ↑ "Container deposit scheme for Queensland". qld.gov.au. Queensland government. Retrieved 27 July 2016. ↑ "Premier Colin Barnett announces 2018 start date for cash for containers scheme". ↑ "Eligible Items & Return Rates"
↑ "Ministarstvo financija: Ne naplaćuje se PDV na naknadu za povrat ambalaže". ↑ "Cabinet Approves Environment Management (Waste Disposal And Recycling) (Amendment) Regulations 2011". Fijian Government. 29 September 2011. Archived from the original on 11 March 2012. Retrieved 2 October 2011. ↑ Laki eräiden juomapakkausten valmisteverosta (1037/2004). Finlex.fi. Retrieved on 2015-08-30. (Finnish). ↑ Laura Descombes, Erkka Ryynänen ja Mari Saario. Pantti on arvostettu brändi. Jäteplus 42/2014. Jätehuoltoyhdistys ry. Retrieved on 2015-08-30. (Finnish). ↑ "Ruling of the Constitutional Court of Germany"
↑ Nethönnun ehf. "Endurvinnslan - English". ↑ "Packaging Europe News - Dutch parliament scraps PET bottle deposit scheme". ↑ "Initiatief tegen afschaffing statiegeld: Een echte held kiest statiegeld". 1 2 "Fakta om Returpack" (PDF). AB Svenska Returpack. Archived from the original (PDF) on September 19, 2007. Retrieved 2010-01-07. 1 2 "33 cl glasflaskan". Sveriges Bryggerier. Retrieved 2008-07-02. 1 2 "50 cl glasflaskan". Sveriges Bryggerier. Retrieved 2008-07-02. ↑ "Fakta om Returpack". AB Svenska Returpack. Archived from the original on 2009-08-30. Retrieved 2008-07-02. ↑ "Om du har producentansvar". Svensk Glasåtervinning. Retrieved 2008-07-02. ↑ "Svensk Glasåtervinning". Sveriges Bryggerier. Retrieved 2008-07-02. ↑ "Standard sedan 1885". Svergies Bryggerier. Archived from the original on September 23, 2007. Retrieved 2008-07-02. ↑ "Sista chansen att panta vin- och spritflaskor". Aftonbladet. 1999-02-21. Retrieved 2008-07-02. ↑ "Svensk författningssamling SFS 2005:220" (PDF). Parliament of Sweden. 2005-04-14. Archived from the original (PDF) on 2007-09-27. Retrieved 2008-07-02. ↑ "Välkommen till Pantamera". Pantamera. ↑ "Fakta om burken". AB Svenska Returpack. Archived from the original on 2009-08-30. Retrieved 2008-07-02. 1 2 3 "BottleBill.org - Beverage Container Legislation in Sweden". 1 2 "Fakta om PET". AB Svenska Returpack. Archived from the original on 2009-08-30. Retrieved 2008-07-02. ↑ "Viktig information angående 4:- pant för hårda retur-PET flaskor Sverige" (PDF) (Press release) (in Swedish). Sveriges Bryggerier. July 2007. Archived from the original (PDF) on 2009-03-20. Retrieved 2008-07-02. ↑ "Pant upphör 30 juni 2008". Sveriges Bryggerier. Archived from the original on 2008-04-23. Retrieved 2008-07-02. ↑ Bundeskanzlei - P. "SR 814.621 Verordnung vom 5. Juli 2000 über Getränkeverpackungen (VGV)".